Frittata, which translates to “fried” in Italian, is an egg-based classic brunch dish. 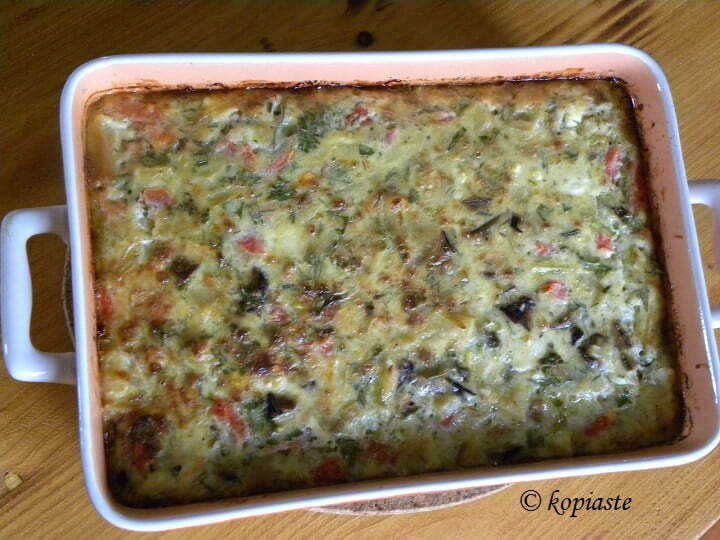 I have used the ingredients of the Greek popular dish called “Moussakas” to make this frittata. This is a great recipe to make if you have only a few eggplants, zucchini and potatoes. Actually, I had some leftover ingredients after making moussakas, which I used for this recipe. It’s cheap and easy to make not to mention that your leftovers are equally delicious the next day to take to work with you! I made this frittata a few weeks later with some zucchini, potatoes, smoked turkey and feta. Heat the olive oil in a large wok style frying pan over high heat and fry the potatoes, mixing regularly, until golden. Remove the potatoes to a platter. Empty the oil in a metallic bowl and leave only a few tablespoons and fry the zucchini as well. Sauté the onion until translucent and add the garlic and mix for a few seconds. Remove from the heat and wait until it cools. Dissolve the corn flour in the milk, add the eggs and beat. Put all the remaining ingredients in a casserole dish and empty the eggs on top. Mix to coat the potatoes. Bake in a preheated oven at 180o C and bake for about 20 minutes or until the eggs set. Frittata, which translates to "fried" in Italian, is an egg-based classic brunch dish. I have used the ingredients of the Greek popular dish called "Moussakas" to make this frittata. Heat the olive oil in a large non-stick frying pan over high heat and fry the potatoes, until golden. Remove the potatoes to a platter and fry the zucchinis as well. Empty the oil in a metallic bowl and leave only a tablespoon. Cut the eggplant into slices and fry until golden. Brush the top with olive oil and turn over. Fry for a few minutes and remove to a cutting board. Beat the eggs for a few minutes and add the cheeses. Brush a 17.5 x 25.5 cm Pyrex or baking dish with olive oil. Empty the batter and bake in a preheated oven to 180oC (or 170o fan forced) for about 30 minutes or until the eggs set. It surely looks very comforting and delicious, Ivy.